Making a smartphone with perfected features that please every user is difficult. It is something like crafting a sculpture out of rock with artistic perfection and excellence. LG has got a skill in making smartphones with premium features loved by everyone. But when it came to G4 I doubt whether they tried to follow this tradition. The new handset from LG named G4 is a flagship smartphone which almost tried to satisfy its users, but I must say it didn’t perfected itself. Every user expected that LG would make a considerable change in the external designing of its new flagship handset. The new handset’s designing features makes it comfortable between its previous model named G Flex2 and G3. The panel designs have got changed from the previous version. They have got a classic metallic finishing on the plastic panels. Also it has got a leather backed panel which is water, dust and corrosion proof which gives it an elegant look. But the rest of the physical designs seem to be a replication of G3. Many users in the tech world expected that LG would have something special for them in the case of processor. Their expectation is genuine since G4 is an annually launched flagship smartphone from the company. But this time LG disappointed its users with low performing processor. 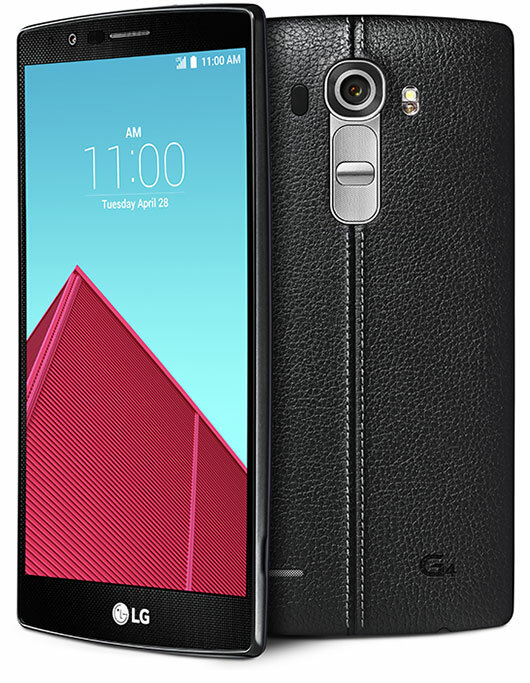 LG has included the most advanced, performing and latest chipset – Snapdragon 810 – for its earlier handset of G Flex2. But when it come to the case of G4, they have included a low cost and low performing chipset – Hexa Core Snapdragon 808 with a speed of 1.8GHz. It is supported by a RAM of 3GB and internal memory of 32GB. This 32GB can be expanded upto 128GB with the help of external microSD Card. LG could have included atleast an eight core processor in such a premium priced handset. This processor do not have a pair of Cortex A57 processor cores which would make it just a silicon piece. It also gives a lower end Adreno 418 GPU, which you may find useless. The display of the handset measures to be 5.5 inches featuring IPS quantum screen. On examining we could understand that the screen uses a varied kind of liquid crystals that allow lights to penetrate. It also uses an innovative backlight adjust that gives a soothing and clear organic colours which makes the display a better one when compared to its competitors. Since it uses the Bravia Engine technology, it is far better than recently released Galaxy S6 and S6 Edge AMOLED screens. Colours appear more realistic in LG G4 when it is compared to Galaxy S6, atleast in case of Red, Black and White. The colours that support the screen display would provide a better look to the images that have taken. While seeing these images, you may doubt it for original, but I must say that sometimes you feel that they have lost their energy. With all these the display is attractive but is not perfect. When talking about Audio features, the tech experts behind the designing of this handset haven’t given much attention to this section. When you play the preloaded tunes in the handset, you may find that the sound is clear only when it is played a respectable volume. When the volume is raised, the clarity reduces and you won’t be able to pick up the channel separation. But it still plays better than Galaxy S6’s speakers. One of the advantages that you may find in most of LG’s handsets about which the company don’t even boast about is that, it plays the music without any interruption even when you have connected a set of Bluetooth headsets along with wired ones into the jack together. You cannot play two different tracks in both the players, still you can listen to music with your wired headphones and Bluetooth headsets connected together. LG focuses on a steady progress rather than bringing out a drastic change. You may find it difficult to find any variations between LG’s user interface named UX 4.0 that is being used in Flex2 and G3. But while looking into the deep we may understand that, with every handset that they launch, they make it lighter and less complicated. This handset has also got slight changes. The Smart Bulletin page integrates data from Calendar App and certain other apps like QRemote and also from LG Health; they all are coupled with informations on how to use them. The Calendar App has got a new Material Design. Another feature called Event Pocket will permit you to get your images, locations and also Facebook events that are about to happen, altogether at a single touch. This application would eventually remind you about the events and prevents you to manually entering those in your reminders. The Knock Code feature provided by Lollipop 5.1 allows you to unlock the screen quickly. Glance View allows you pull down the screen from the top if you would like to have your time checked. You are also given 100GB space in Google Drive. This is an associated advantage that you would get if you purchase G4. But it is available only for 2 years. If you want it for continuous use you may have to pay subscription fees annually as per the instructions provided by Google. G4 has got a 16MP camera on its back. This is likely to be used by some photogenic travellers to take a clear snap whenever they want it. The camera provides a wide aperture of 1/2.6 inches which is far better than S6’s 1/3 inches and iPhone. Another feature that adds to perfection is the presence of Colour Spectrum Sensor which is placed under LED flash, which scans the things to which the camera is being pointed before taking the snap. It would give the exact view of the object when the photo is taken. This feature also helps in balancing the colours and tries to give a natural feel to every image. Another notable feature of G4 cam is that it can be used to capture images even in dim lights. It is because of its f/1.8 lens, which allows its user to capture most beautiful images even in less light without losing its originality. The front facing cam is with a power of 8MP with f/2.0 lens. When you click it for a selfie, it would take four images in a go and you can keep the best and share it. With these features they also provide for video recording with 4K clarity. The battery has a capacity of 3000mAh. With this much power it could run the normal functions of the handset for upto one day without juicing up in between. Since it uses a Hexa Core processor instead of a Quad Core, it won’t drain much of its battery for normal functioning of the handset. The video playback which is tested lasted for 11 hours and 2 minutes which is better than 9 hours of S6. When the battery is low it automatically stand-down to battery saver mode which will automatically shut down all other battery draining application. It helps in preventing the handset from switching-off due to low power. More details. When looking at the chart it is clear that in certain testing, LG G4 stands better than its competitors such as in CF-Bench, Vellamo 3.0 and like so. The handset can be connected to WiFi compatible with a bandwidth of 802.11 a/ac/b/g/n. The Bluetooth connectivity is provided by the version 4.1 A2DP. The phone features dual SIM capacity with either 3G or 4G connectivity. But the SIM should be Nano SIM. Data can be transferred with the help of USB port of microUSB 2.0. Handset also supports HDMI Port and Micro HDMI Type D. More connectivity options are also available such as Computer Sync, DLNA, NFC, OTA Sync, Micro HDMI Type etc. The prices are fixed at nearly $200-250 with contract. The more stiff competition will be from Galaxy S6 and HTC One M9. Both these smartphones have more or less near scores with G4 on their performance tests. Also the price of these handsets stands near to each other in the world mobile markets across. It is obvious that G4 has to face a stiff completion from these smartphones in the market. QHD screen with 16M colour support. Attractive designing with metallic finish. Leather Panel for the back. Removable Battery with solid life. Google Drive storage upto 100GB free for 2 years. High end camera with Flash and Colour Spectrum Sensor. High quality display with multi colour support. No option for Quick Charging. Processor is not Octa Core when compared to other premium handsets. Design is classy but nothing special. No improvement over audio speakers. Performance is little bit compromised when compared to that of competitors.